Illustration for a Guardian article by Dom McKenzie Illustration & Design. Chad Pearson teaches history at Collin College in Plano, Texas and is the author of Reform or Repression: Organizing America’s Anti-Union Movement. He delivered shortened versions of this article before members of the Department of History at the University of North Texas in spring 2014 and at the 2017 U.S. Intellectual History Conference in Plano, Texas. He would like to thank David Anderson, L. D. Burnett, David Cullen, Steve Early, Rosemary Feurer, Robert Justin Goldstein, Dolores Janiewski, Mark A. Lause, John Marciano, Sandra Mendiola, Bryan D. Palmer, Paul Street, Elizabeth Hayes Turner, Michael D. Yates, and Camila Quarta for their help on this piece. The smart way to keep people passive and obedient is to strictly limit the spectrum of acceptable opinion, but allow very lively debate within the spectrum. Studies of American conservatism appear practically everywhere. Focusing chiefly, though not exclusively, on the post–New Deal decades, this body of scholarship, most of which has been produced by liberal academics, has deepened our understanding of Republican politicians, religious and racist campaigns, tax-cutting activists in the South, West, and Southwest, and the often-secretive forces behind the erosion of the nation’s social safety net. We have learned about business assaults on labor, well-funded think tanks like the American Enterprise, Cato, and Hoover Institutes, and magazines like National Review. Historians have provided us with studies of boogeymen like Barry Goldwater, Richard Nixon, Ronald Reagan, Milton Friedman, James McGill Buchanan, and the Koch brothers, as well as examinations of boogeywomen like Ayn Rand, Phyllis Schlafly, Sarah Palin, and Margaret Thatcher. Scholars have written decade-specific studies, underlining the conservative 1940s, ’50s, ’60s, ’70s, and ’80s. A consensus has evolved around the idea that the last four decades mark the emergence of neoliberalism. We have collections of essays, primary source readers, and history departments offer courses called From Roosevelt to Reagan and the Rise and Fall of the New Deal Order. While the explosion of these studies has undoubtedly enriched our understanding of these powerful forces and individuals, we are due for critical assessments of these studies from the left.1 This article is one such attempt, focusing on some of the blind spots that plague this scholarship and on the arrogant dismissals of class-based interpretations of the past. 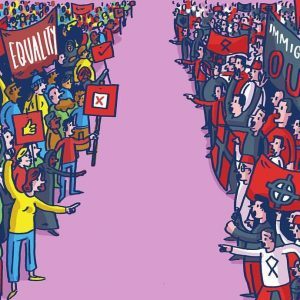 Over the past few decades, these dismissals, expressed by some of the profession’s most institutionally privileged members, have led to a narrowing of discussions and debates by limiting studies to the tensions between liberals and conservatives and by downplaying or ignoring leftist critiques of liberalism. This is unfortunate, since many of these same gatekeepers have exaggerated the differences between Republicans and Democrats, refusing to acknowledge what establishment liberals and institutional rightists share. Although there are obvious differences between conservatives and liberals, there are also meaningful similarities, particularly regarding education, financial regulation, foreign policy, policing, trade, and labor. 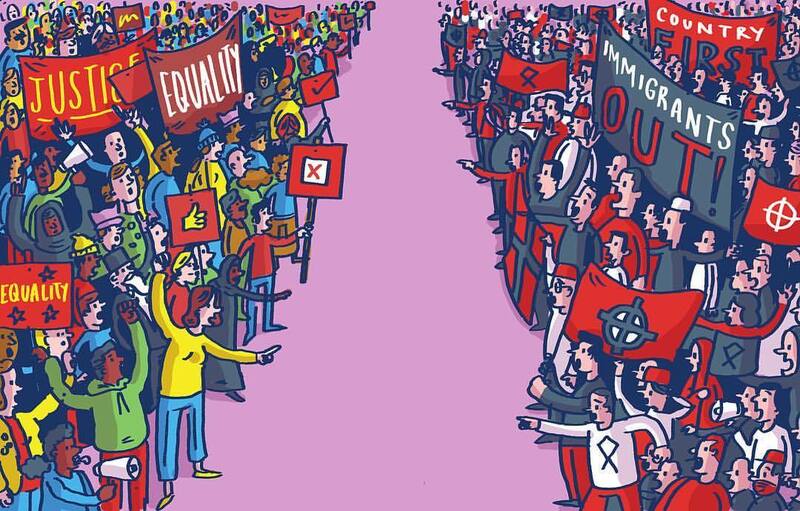 The uptick in studies of conservatism, dating from the early 1990s to the present, represent a departure from the more radical historiographical tradition of the 1960s and ’70s that was shaped by the social movements of the time. The period’s radicalism—expressed by the antiwar, civil rights, women’s liberation, and gay liberation movements, as well as by the widespread popularity of Marxist study groups—helped influence scholarship in two fundamental ways. First, there was the development of what the late historian Jesse Lemisch famously called, in 1967, “history from the bottom up.”3 During this politically and intellectually exciting time, public and professional historians wrote diverse histories of ordinary people rather than studies about kings, presidents, and business leaders. Second, recognizing Franklin D. Roosevelt’s numerous shortcomings, Harry S. Truman’s destructive Cold War polices, John F. Kennedy’s foot-dragging on civil rights, Lyndon B. Johnson’s murderous campaigns in Vietnam, and the unwillingness of establishment liberals to challenge structural inequality, New Left scholars were deeply distrustful of the Democratic Party, institutional liberalism, and U.S. capitalist society. This generation of class-conscious leftist scholars stood with ordinary people and their fights, never ignoring managerial exploitation, state repression, or the historic injustice of capitalism.19 Montgomery understood clearly what he called in 1979 “the awesome power which a company wields over its employees” and “the coercive authority of government.”20 For this generation, capitalists, their managers, and both main political parties that have historically served the interests of big business, deserved the primary blame for the problems faced by the diverse, working-class masses before, during, and after the years of the New Deal. Some of the leading writers and promoters of “rise of the right” scholarship, including former labor historians, began distancing themselves from labor history and attacking radical interpretations of the past around the same time they started producing histories of conservatism. The cases of Princeton University’s Sean Wilentz and Georgetown University’s Michael Kazin, two scholars who had established their careers as labor historians but now identify as political historians, are instructive. In the 1990s, Wilentz, the author of a book about New York City’s working class, became a political historian as well as an enthusiastic supporter and colleague of the Clintons.21 In the introduction to his 2008 book on Ronald Reagan, Wilentz admitted that his “views have ripened over time.”22 Kazin, who left his first major academic mark in 1987 with a study of San Francisco trade unions in the Progressive Era, has expressed regret about parts of his past.23 “Despite claiming to be hard-headed Marxists,” Kazin wrote in 2013, “our analysis of American society was more emotional than rational.” Kazin tells us that he and his comrades were strategically wrongheaded for referring to the police as “pigs” and for spelling America with three Ks.24 Kazin has since distanced himself from what he considers an irrational period tarnished by counter-productive ultraleftism. Nevertheless, he remains politically active and was partially responsible for launching Historians for Obama in 2007. Younger scholars have joined Wilentz and Kazin in promoting respect for and the study of mainstream politics. Princeton University’s Julian Zelizer, too young to have been involved in the New Left, has written that our contemporary historiographical moment, shaped partially by studies of conservatism, is superior to earlier periods when old-fashioned labor historians were drawn to the question, “‘Why No Socialism in America?’ with the implicit assumption that socialism should have happened.”29 For the record, many, if not most, labor historians were not focused on this question. Yet, it would be wrong to claim that Zelizer’s comment signals intellectual laziness. Instead, it likely reflects his desire to promote the study of official politics over the subject of class struggle. For example, in 2012, Zelizer, writing with New York University’s Kim Phillips-Fein, observed that policymakers in governmental institutions were unfairly criticized and often overlooked by a generation of class-conscious historians: “They downplayed the ability of government to produce genuine reform” and focused “instead on grassroots efforts.”30 Zelizer, an editor of a Princeton University Press political-history series, wants readers to perceive liberal scholars like him as more sophisticated than the New Leftists, maintaining that “the best scholarship about conservatism has been written by liberals.”31 His comments about socialism and the New Left generation are primarily designed to delegitimize radical critiques of power relations while highlighting the virtues of more politically moderate scholarship. The smug dismissals of labor history, and the attacks on radical history more generally, play an institutionally policing role that sets clear boundaries between different scholarly trends, while simultaneously building liberal scholarship and sustaining its echo chambers. The underlying message is rather clear: these earlier labor historians—hopelessly out-of-touch radicals—were guilty of placing too much emphasis on class struggle and thus failed to acknowledge most Americans’ appreciation for the nation and its institutions, particularly its two mainstream political parties. Most Americans, according to their assumptions, were religious, law abiding, and patriotic. And these historians want their colleagues to recognize, in short, that the New Left is now old and it is not coming back. Their boundary-setting agendas are meant, above all, to convince fellow scholars to acknowledge that the most meaningful conflicts have taken place in the context of official politics, not between antagonistic classes. As editors of university-press books and journals as well as faculty members at elite universities, they enjoy the academic prestige and institutional power to call many of the shots and thus secure political moderation from career-oriented junior historians. Above all, these historians like to tell tidy, rise-and-fall stories that focus on voting behavior, official union activities, politicians, and state institutions while often ignoring or marginalizing the role of radicals. These well-ordered narratives begin with the Progressive Era’s various reforms and reformers, climax with the labor victories of the 1930s and the civil rights triumphs of the 1960s, and end, dramatically, under Reagan’s presidency, a time characterized by tax cuts, deregulation, and crass union busting. The near erasure of independent, working-class radicalism—that is, mostly leftist activists of various stripes who mobilized outside of official labor-liberal coalitions—from so much scholarship has led some historians of conservatism to mischaracterize the left. Take, for example, Benjamin Waterhouse, a historian of business and conservatism. In his 2013 book, Lobbying America: The Politics of Business from Nixon to NAFTA, which was published as part of a Princeton University Press series partially edited by Zelizer, Waterhouse refers to free trade opponents as the “far left.” “On the far left of the spectrum,” Waterhouse writes, “some labor and public interest groups called for reciprocal tariffs, trade quotas, and other measures frequently demonized by opponents as ‘protectionist.’”45 It is doubtful that AFL-CIO officials—a handsomely compensated group far more willing to deliver speeches announcing their desire to defend “middle-class America” than actually to encourage militant mobilizations of rank-and-file members—ever saw themselves in this way. But Waterhouse, like more senior historians, appears to have no interest in exploring the ideas of the true “far left,” who are anticapitalists, not merely anti-free traders. It appears that, for him, the left’s limitations extend only to the liberal lobbyists who call for government regulatory programs, not to those who champion the end of capitalism itself. When we consider that radical interpretations of labor and politics used to be commonplace, it is astonishing to see how far the left has been pushed back in the historical memory. Theodore Roosevelt was joined by other well-known reformers. Mainstream figures like journalist Ray Stannard Baker, Holmes Jr., Brandeis, and U.S. Senator Robert L. Owen, best known for the 1916 Keating-Owen child-labor law, supported union-breaking campaigns in the early twentieth century.51 Indeed, none of the period’s elite reformers endorsed the core ingredients necessary for a healthy labor movement: militancy, solidarity, and independence from capitalist political parties. While MacLean and others want us to remember Brandeis as an advocate of business and political transparency, as well as a union supporter, he hardly practiced what he preached. He spent much of the Progressive Era representing several highly secretive antiunion associations.52 Additionally, many employers in the vanguard of anti-labor union activities were Civil War veterans and proudly cited Abraham Lincoln and his defense of “free labor” over slavery during workplace disputes.53 These details are usually absent from the trendiest studies of the rise of the right, which ordinarily begin after the New Deal and contend that antiunion ideas and actions emerged as part of a right-wing movement. The reality, however, is more complex. Recently, a growing number of leftist scholars have offered much-needed critiques of establishment liberalism and, in the process, have shown the limitations of focusing largely on the Republican Party and its ideological backers. This is true of historians of both domestic and foreign affairs. Scholars of race, for instance, have done excellent work in highlighting the ways liberals such as Lyndon B. Johnson and Bill Clinton have aggressively promoted the politics of law and order and thus helped set the stage for the nation’s excessively high incarceration rate, which disproportionately punishes African Americans and Latinos.54 Others have taught us much about the deceitful roles establishment liberals have played in selling U.S. wars under the banner of humanitarian intervention.55 Indeed, those seeking an honest account of the rise of the carceral state and the vicious nature of U.S. imperialism must grapple with the repressive actions of both conservatives and institutional liberals. Class-conscious historians have honored the tradition of writing the type of radical working-class history fought for by Lemisch, Rawick, Montgomery, Zinn, and others by producing their own multidimensional studies of labor militancy. This has been true for postwar scholars, some of whom have taught us about the deradicalizing and solidarity-breaking nature of the National Labor Relations Board while pointing to the emancipatory potential of confrontational rank-and-file activism on the local, national, and even international levels.56 And in the aftermath of the Occupy Wall Street movement in 2011, several writers have produced scholarship that identifies the key source of our problems: the 1 percent, which maintains the dominant influence on politicians from both parties, including Chicago’s labor-hating Democratic mayor, Rahm Emanuel.57 These are encouraging developments. As most Democratic Party politicians of all levels continue to disappoint by prioritizing the interests of the 1 percent over the working-class majority, new generations of scholar-activists will discover the enduring value of applying a class analysis to the past and the usefulness of spotlighting the structural ills of capitalism itself. How much influence these more critical monographs will have on the public’s understanding of the past remains a question. Yet, at this point, we can safely say that this more radical scholarship has not caught up with the rapid pace of scholarly output about the various dimensions of conservatism. Indeed, there is a long history of right-wing activism and powerful conservative forces that are clearly different from mainstream liberalism. It is important that we know about the activities of the Koch brothers, the American Legislative Exchange Council, the Chicago school of economics, and countless think tanks, as detailed in books and articles written by liberal historians. Yet it seems that the ex-leftists behind some of this scholarship, who routinely display irritation at the latest reactionary outrage while remaining mostly silent about the comprehensive threats posed by both parties and capitalism itself, are somehow compensating for their own shifts to the right. Whatever the case, we should not allow them or their followers to bamboozle us into believing that the Democrats somehow offer genuine solutions to our problems. The Democratic Party and its salaried accomplices in think tanks, journalism, and academia share the blame with employers and Republicans for the labor movement’s decline, extreme class inequality, and the country’s persistent poverty. What Zinn, Davis, Montgomery, and many lesser known radicals stated in the 1960s, ’70s, and ’80s about institutional liberals protecting ruling-class interests at the expense of workers was true then and remains true today. Fortunately, many of today’s scholar-activists, reinforcing the sharp insights of those from the New Left generation, recognize that we cannot simply criticize the rightists. Indeed, we must take their words seriously and reject the bar-lowering goals set by today’s historians of conservatism. ↩ Steve Fraser and Gary Gerstle, eds., The Rise and Fall of the New Deal Order, 1930–1980 (Princeton: Princeton University Press, 1989); Michael Kazin, “To the Right: The Transformation of American Conservatism,” American Historical Review 97 (1992): 136–55; Alan Brinkley, “The Problem of American Conservatism,” American Historical Review 99 (1994): 409–29; Elizabeth Fones-Wolf, Selling Free Enterprise: The Business Assault on Labor and Liberalism, 1945–60 (Urbana: University of Illinois Press, 1994); Lisa McGirr, Suburban Warriors: The Origins of the New American Right (Princeton: Princeton University Press, 2001); Rick Perlstein, Before the Storm: Barry Goldwater and the Unmaking of the American Consensus (New York: Hill & Wang, 2001); Donald T. Critchlow, Phyllis Schlafly and Grassroots Conservatism: A Woman’s Crusade (Princeton: Princeton University Press, 2005); Kevin Kruse, White Flight: Atlanta and the Making of Modern Conservatism (Princeton: Princeton University Press, 2005); Matthew Lassiter, The Silent Majority: Suburban Politics in the Sunbelt South (Princeton: Princeton University Press, 2006); Joseph Crespino, In Search of Another Country: Mississippi and the Conservative Counterrevolution (Princeton: Princeton University Press, 2007); William Link, Righteous Warrior: Jesse Helms and the Rise of Modern Conservatism (New York: St. Martin’s, 2008); Bruce J. Schulman and Julian Zelizer, eds., Rightward Bound: Making America Conservative in the 1970s (Cambridge: Harvard University Press, 2008); Rick Perlstein, Nixonland: The Rise of a President and the Fracturing of America (New York: Scribner, 2008); Joseph E. Lowndes, From the New Deal to the New Right: Race and the Southern Origins of Modern Conservatism (New Haven: Yale University Press, 2008); Kevin Mattson, Rebels All! A Short History of the Conservative Mind in Postwar America (New Brunswick: Rutgers University Press, 2008); Sean Wilentz, The Age of Reagan: A History, 1974–2008 (New York: Harper, 2008); Kim Phillips-Fein, Invisible Hands: The Businessmen’s Crusade Against the New Deal (New York: W. W. Norton, 2009); Bethany E. Moreton, To Serve God and Wal-Mart: The Making of Christian Free Enterprise (Cambridge: Harvard University Press, 2009); Jennifer Burns, Goddess of the Market: Ayn Rand and the American Right (Oxford: Oxford University Press, 2009); David Farber, The Rise and Fall of Modern American Conservatism: A Short History (Princeton: Princeton University Press, 2010); Laura Kalman, Right Star Rising: A New Politics, 1974–1980 (New York: W. W. Norton Company, 2010); Michael Bowen, The Roots of Modern Conservatism: Dewey, Taft, and the Battle for the Soul of the Republican Party (Chapel Hill: University of North Carolina Press, 2011); Corey Robin, The Reactionary Mind: From Edmund Burke to Sarah Palin (New York: Oxford University Press, 2011); Darren Dochuk, From Bible Belt to Sun Belt: Plain-Folk Religion, Grassroots Politics, and the Rise of Evangelical Conservatism (New York: W. W. Norton, 2011); Angus Burgin, The Great Persuasion: Reinventing Free Markets Since the Depression (Cambridge: Harvard University Press, 2012); Landon R. Y. Storrs, The Second Red Scare and the Unmaking of the New Deal Left (Princeton: Princeton University Press, 2012); Michelle M. Nickerson, Mothers of Conservatism: Women and the Postwar Right (Princeton: Princeton University Press, 2012); Nelson Lichtenstein and Elizabeth Tandy Shermer, eds., The Right and Labor in America: Politics, Ideology, and Imagination (Philadelphia: University of Pennsylvania Press, 2012); Daniel Stedman Jones, Masters of the Universe: Hayek, Friedman, and the Birth of Neoliberal Economics (Princeton: Princeton University Press, 2012); Elizabeth Tandy Shermer, Sunbelt Capitalism: Phoenix and the Transformation of American Politics (Philadelphia: University of Pennsylvania Press, 2013); Colleen Doody, Detroit’s Cold War: The Origins of Postwar Conservatism (Urbana: University of Illinois Press, 2013); Sophia Z. Lee, The Workplace Constitution, from the New Deal to the New Right (New York: Cambridge University Press, 2014); David O’Donald Cullen and Kyle G. Wilkison, eds., The Texas Right: The Radical Roots of Lone Star Conservatism (College Station: Texas A & M University Press, 2014); Seth Dowland, Family Values and the Rise of the Christian Right (Philadelphia: University of Pennsylvania Press, 2015); Edward H. Miller, Nut Country: Right-Wing Dallas and the Birth of the Southern Strategy (Chicago: University of Chicago Press, 2015); Nicole Hemmer, Messengers of the Right: Conservative Media and the Transformation of American Politics (Philadelphia: University of Pennsylvania Press, 2016); E. J. Dionne Jr., Why the Right Went Wrong: Conservatism—From Goldwater to Trump (New York: Simon & Schuster, 2016); Jason M. Stahl, Right Moves: The Conservative Think Tank in American Political Culture Since 1945 (Chapel Hill: University of North Carolina Press, 2016); Katherine Rye Jewell, Dollars for Dixie: Business and the Transformation of Conservatism in the Twentieth Century (Cambridge: Cambridge University Press, 2017); Nancy MacLean, Democracy in Chains: The Deep History of the Radical Right’s Stealth Plan for America (New York: Viking, 2017). For a useful, though slightly dated, overview, see Kim Phillips-Fein, “Conservatism: A State of the Field,” Journal of American History 98 (2011): 723–743. ↩ Robert Buzzanco has made a similar observation about the decline of leftist influences in diplomatic historiography. See Buzzanco, “What Happened to the New Left? : Toward a Radical Reading of American Foreign Relations,” Diplomatic History 23 (1999): 575–607. ↩ For context, see Paul Le Blanc, Left Americana: The Radical Heart of US History (Chicago: Haymarket, 2017), xxi–xxii. ↩ Robert Brenner, “Can the Left Use the Democratic Party?” Against the Current 3 (1984): 4. ↩ Howard Zinn, Postwar America, 1945–1971 (1973; repr. Boston: South End, 2002), 31–32. ↩ Zinn, Postwar America , 89. ↩ The Editors, “Introduction,” Radical America 9 (1975): 3. Also see James Green, “Fighting on Two Fronts: Working-Class Militancy in the 1940s,” Radical America 9 (1975): 7–48; and Nelson Lichtenstein, “Defending the No-Strike Pledge: CIO Politics During World War II,” Radical America 9 (1975): 49–76. ↩ Mike Davis, “The Barren Marriage of American Labour and the Democratic Party,” New Left Review 124 (1980): 43–84. ↩ Howard Zinn, A People’s History of the United States (New York: Harper & Row, 1980). ↩ Carol Lasser, “Linda Gordon” (a 1981 interview with Linda Gordon), in Visions of History , ed. Henry Abelove, Betsy Blackmar, Peter Dimock, and Jonathan Schneer (New York: Pantheon, 1983), 78. ↩ George P. Rawick, “Working Class Self-Activity,” Radical America 3 (1969): 23–31. On Rawick’s influence, see David Roediger, Class, Race, and Marxism (London: Verso, 2017), 73–97. ↩ Mike Davis, Prisoners of the American Dream: Politics and Economy in the History of the U.S. Working Class (London: Verso, 1986); Kim Moody, An Injury to All: The Decline of American Unionism (London: Verso, 1988); and Peter Rachleff, Hard-Pressed in the Heartland: The Hormel Strike and the Future of the Labor Movement (Boston: South End, 1993). ↩ David Montgomery, Beyond Equality: Labor and the Radical Republicans, 1862–1872 (New York: Knopf, 1967); David Montgomery, Workers’ Control in America (Cambridge: Cambridge University Press, 1979); David Montgomery, The Fall of the House of Labor: The Workplace, the State, and American Labor Activism, 1865–1925 (Cambridge: Cambridge University Press, 1987); and David Montgomery, Citizen Worker: The Experience of Workers in the United States with Democracy and the Free Market during the Nineteenth Century (Cambridge: Cambridge University Press, 1993). ↩ David Montgomery, The Fall of the House of Labor: The Workplace, the State, and American Labor Activism, 1865–1925 (Cambridge: Cambridge University Press, 1987), 1. ↩ Henry Heller, The Capitalist University: The Transformation of Higher Education in the United States, 1945–2016 (London: Pluto, 2016), 124. ↩ Eric Foner, “David Montgomery Obituary,” Guardian , December 11, 2011. ↩ Montgomery, Workers’ Control in America , 153. ↩ Montgomery, Workers’ Control in America , 165. ↩ See, for example, Harry Braverman, Labor and Monopoly Capital: The Degradation of Work in the Twentieth Century , 25th anniversary ed. (New York: Monthly Review Press, 1998); Robert Justin Goldstein, Political Repression in Modern America: From 1870 to 1976 (Cambridge: Schenkman, 1978); and Manning Marable, How Capitalism Underdeveloped Black America (Boston: South End, 1983). ↩ Montgomery, Workers’ Control in America , 156, 158. ↩ Sean Wilentz, Chants Democratic: New York City and the Rise of the American Working Class, 1788–1850 (Oxford: Oxford University Press, 1984). ↩ Sean Wilentz, The Age of Reagan: A History, 1974–2008 (New York: Harper, 2008), 3. ↩ Michael Kazin, Barons of Labor: The San Francisco Building Trades and Union Power in the Progressive Era (Urbana: University of Illinois Press, 1987). ↩ Bruce Robbins, James Livingston, Corey Robin, and Michael Kazin, “Reading from Left to Right: A Symposium on American Dreamers and The Reactionary Mind ,” Dissent , July 30, 2013. On Kazin’s ultra-left phase, see Paul Le Blanc and Michael D. Yates, A Freedom Budget for All Americans: Recapturing the Promise of the Civil Rights Movement in the Struggle for Economic Justice Today (New York: Monthly Review Press, 2013), 165. ↩ On Kazin’s critiques, see Kazin, “Struggling with Class Struggle: Marxism and the Search for a Synthesis of U.S. Labor History,” Labor History 28 (1987): 497–514; and Kazin, “Limits of the Workplace,” Labor History 30 (1989): 110–13. ↩ Sean Wilentz, quoted in Michael Powell, “Howard Zinn, Historian, Dies at 87,” New York Times , January 27, 2010. ↩ Michael Kazin, “Howard Zinn’s History Lessons,” Dissent 51 (2004). Kazin recycled the same points in “Howard Zinn’s Biggest Failing,” Guardian , January 30, 2012. Kazin also lectured about Zinn. Michael Kazin, “Howard Zinn and the Politics of History,” (lecture, the City University of New York Graduate Center, New York, NY, sponsored by Advanced Research Collaborative, April 24, 2014). ↩ Julian Zelizer, “Reflections: Rethinking the History of American Conservatism,” Reviews in American History 38 (2010): 387. Importantly, Zelizer offers no source for his claim that labor historians of the 1960s “were fascinated by the question of ‘Why No Socialism?’” This is a rather old question that prominent economists and historians debated and discussed decades before the 1960s. By the 1960s, the most meaningful historiographical development in labor studies, and perhaps in social history more generally, was the emergence of the so-called new labor history, a body of work pioneered largely by E. P. Thompson in the United Kingdom and Herbert G. Gutman in the United States. It focused less on the history of labor as a movement and more on workers’ cultural lives and their informal acts of resistance in both their workplaces and communities. Gutman was not especially interested in the “why no socialism” debate, stating that it was not “a well-put historical question.” Herbert G. Gutman, Power & Culture: Essays on the American Working Class (New York: Pantheon, 1987), 343. ↩ Kim Phillips-Fein and Julian Zelizer, “Introduction: What’s Good for Business,” in What’s Good for Business: Business and American Politics since World War II (Oxford: Oxford University Press, 2012), 5. ↩ Stephanie Luce, “Labor Studies Under Siege,” Against the Current 118 (2005). ↩ For a slightly dated account of professors’ discomfort with labor history and the general state of the field, see Chad Pearson, “From the Labour Question to the Labour History Question,” Labour/Le Travail 66 (2010): 195–230. ↩ On this organization, see Laurence H. Shoup, Wall Street’s Think Tank: The Council on Foreign Relations and the Empire of Neoliberal Geopolitics, 1976–2014 (New York: Monthly Review Press, 2015). Kazin has contributed to this organization’s journal, Foreign Affairs . See Kazin, “Trump and American Populism,” Foreign Affairs 95 (2016): 17–24. ↩ Consider E. J. Dionne Jr., a Washington Post columnist, NPR commentator, Brookings Institution fellow, and Georgetown professor. While Dionne routinely and tepidly criticizes conservatives, his institutional and economic ties make critiquing the Democratic Party against his interests. E. J. Dionne Jr., Why the Right Went Wrong: Conservatism—From Goldwater to Trump (New York: Simon & Schuster, 2016). ↩ Doody, Detroit’s Cold War , 28 and Lee, The Workplace Constitution , 255. ↩ Nancy MacLean, Democracy in Chains: The Deep History of the Radical Right’s Stealth Plan for America (New York: Viking, 2017), 292. ↩ Nancy MacLean, “Guardians of Privilege,” in Debating the American Conservative Movement: 1945 to the Present , ed. Donald T. Critchlow and Nancy MacLean (Lanham: Rowman & Littlefield, 2009), 128. ↩ Nelson Lichtenstein, “David Montgomery and the Idea of ‘Workers’ Control’,” Labor: Studies in Working-Class History of the Americas 10 (2013): 70. Leftist scholars have criticized Lichtenstein harshly for his biography of Walter Reuther. See Martin Glaberman, “Walter Reuther, ‘Social Unionist’,” Monthly Review 48 (November 1996): 52–57; and Michael Goldfield, “On Walter Reuther: Legends and Lessons,” Against the Current 67 (1997). ↩ Complementing my own view, Richard McIntyre and Michael Hillard have pointed out that numerous liberals have embraced a “false nostalgia” about the postwar period and today are more inclined to advocate for “worker-management cooperation” than the establishment of “militant anti-capitalist working class organizations.” Richard McIntyre and Michael Hillard, “Capitalist Class Agency and the New Deal Order: Against the Notion of a Limited Capital-Labor Accord,” Review of Radical Political Economics 45 (2012): 145. ↩ Kevin Mattson, When America Was Great: The Fighting Faith of Postwar Liberalism (New York: Routledge, 2004). Mattson has also contributed to the scholarship on conservatism. See Mattson, Rebels All! ↩ There are many examples of labor-law violations by employers. James Young notes the ways General Electric violated National Labor Relations Board rules without facing serious consequences during a dramatic 1969–70 strike. James Young, Union Power: The United Electrical Workers in Erie, Pennsylvania (New York: Monthly Review Press, 2017), 196-8. ↩ Michael Dennis, Blood on Steel: Chicago Steelworkers and the Strike of 1937 (Baltimore: Johns Hopkins University Press, 2014), 71; Ahmed White, The Last Great Strike: Little Steel, the CIO, and the Struggle for Labor Rights in New Deal America (Oakland: University of California Press, 2016); and Bryan D. Palmer, Revolutionary Teamsters: The Minneapolis Truckers’ Strike of 1934 (Chicago: Haymarket, 2014), 240–41. ↩ MacLean, Democracy in Chains , 191. ↩ Benjamin C. Waterhouse, Lobbying America: The Politics of Business from Nixon to NAFTA (Princeton: Princeton University Press, 2013), 241. ↩ Nelson Lichtenstein and Elizabeth Tandy Shermer, The Right and Labor in America: Politics, Ideology, and Imagination (Philadelphia: University of Pennsylvania Press, 2012), 1–2. Lichtenstein sidesteps the issue of Obama’s lack of progressive accomplishments during his first two years, but echoes the early predictions that Obama was slated to implement a “new New Deal.” One of the many inconvenient details that Lichtenstein neglects to mention is the fact that Obama immediately surrounded himself with Wall Street insiders. Lichtenstein, “Labor, Liberalism, and the Democratic Party: A Fruitful but Vexed Alliance,” in Making Sense of American Liberalism , ed. Jonathan Bell and Timothy Stanley (Urbana: University of Illinois Press, 2012), 235. ↩ While Dionne claims that the Occupy Wall Street movement pushed Obama to the left, he fails to mention that Obama’s forces, including the FBI, Homeland Security, and local police departments destroyed Occupy Wall Street encampments and terrorized protestors. Dionne Jr., Why the Right Went Wrong , 341. ↩ In a 2013 op-ed, rather than point out the conservative roots of the ACA, Lichtenstein made a case for defending it from the Republicans who hailed “from the old Confederacy.” See Lichtenstein, “Obamacare: New Fight, Old tactics,” Los Angeles Times , September 8, 2013. We should hardly be surprised by Obama’s business-first policies, that writers have long warned us about. For an early analysis published in 1996 and later turned into a book chapter, see Adolph Reed Jr., Class Notes: Posing as Politics and Other Thoughts on the American Scene (New York: New Press, 2000), 13. ↩ In a confusing passage, Kazin writes that Theodore Roosevelt “promoted regulation and craft unions.” Nowhere does Kazin mention Roosevelt’s open-shop advocacy. In fact, the phrase “open-shop” is entirely missing from Kazin’s index. Kazin, American Dreamers: How the Left Changed a Nation (New York: Alfred A. Knopf, 2011), 111. ↩ Noel Sargent, “Can Justice Be Partial?,” National Association of Manufacturers’ Labor Relations Bulletin 28 (1938): 10; William Millikan, A Union Against Unions: The Minneapolis Citizens Alliance and Its Fight Against Organized Labor, 1903–1947 (St. Paul: Minnesota Historical Society, 2001); and Chad Pearson, “‘For the Protection of the Common People’: Citizens, Progressives, and ‘Free Workers’,” chap. 2 in Reform or Repression: Organizing America’s Anti-Union Movement (Philadelphia: University of Pennsylvania Press, 2016). ↩ Baker popularized the phrase “right to work” after the 1902 anthracite coal strike. Ray Stannard Baker, “The Right to Work: The Story of the Non-Striking Miners,” McClure’s Magazine 20 (1903): 323–36. Holmes expressed antiunionism in various Supreme Court cases, including as the author of the 1909 Moyer v. Peabody decision, which justified the lack of due process in the jailing of union leader Charles Moyer during a 1903 Colorado coal strike. He also voted against organized labor’s interest in Loewe v. Lawlor (1908) and in Gompers v. Buck’s Stove & Range Co. (1911). See G. Edward White, Justice Oliver Wendell Holms: Law and the Inner Self (Oxford: Oxford University Press, 1993), 335, 343, 349. In 1905, Owen helped form the union-busting Muskogee Citizens’ Alliance. See “Owen Back to the Alfalfa,” Omaha Daily Bee , October 5, 1908. ↩ MacLean is hardly alone in describing Brandeis as pro-union. See Nelson Lichtenstein, State of the Union: A Century of American Labor (Princeton: Princeton University Press, 2002), 273. To his credit, Lichtenstein has called for a renewed, militant labor movement. But it is unclear how he reconciles this call with his respect for the antimilitant Brandeis. ↩ This was true of Allan Pinkerton of the Pinkerton Detective Agency, H. M. Hoxie, a railroad manager and former abolitionist who fought the Knights of Labor-led southwest railroad strikes in the mid–1880s, and many Progressive Era union busters. Mark A. Lause, Free Labor: The Civil War and the Making of an American Working Class (Urbana: University of Illinois Press, 2015), 177–78; Theresa Ann Case, The Great Southwest Railroad Strike and Free Labor (College Station: Texas A and M University Press, 2010), 187; and Pearson, Reform or Repression . ↩ Naomi Murakawa, The First Civil Right: How Liberals Built Prison America (Oxford: Oxford University Press, 2014); Elizabeth Hinton, From the War on Poverty to the War on Crime: The Making of Mass Incarceration in America (Cambridge: Harvard University Press, 2016); and Keeanga-Yamahtta Taylor, From #BlackLivesMatter to Black Liberation (Chicago: Haymarket, 2016). ↩ Dennis Perrin, Savage Mules: The Democrats and Endless War (London: Verso, 2008) and Richard Seymour, The Liberal Defense of Murder (London: Verso, 2008). ↩ Vanessa Tait, Poor Workers’ Unions: Rebuilding Labor from Below (Cambridge: South End, 2005); Sheila Cohen, Ramparts of Resistance: Why Workers Lost Their Power and How to Get it Back (London: Pluto, 2006); Aaron Brenner, Robert Brenner, and Cal Winslow, eds., Rebel Rank and File: Labor Militancy and Revolt from Below During the Long 1970s (London: Verso, 2010); Staughton Lynd, Doing History from the Bottom Up: On E. P. Thompson, Howard Zinn, and Rebuilding the Labor Movement from Below (Chicago: Haymarket, 2014); Kim Moody, In Solidarity: Essays on Working-Class Organization and Strategy in the United States (Chicago: Haymarket, 2014); Young, Union Power ; Immanuel Ness, Southern Insurgency: The Coming of the Global Working Class (London: Pluto, 2016); and Michael D. Yates, Can the Working Class Change the World? (New York: Monthly Review Press, 2018). ↩ Kari Lydersen, Mayor 1%: Rahm Emanuel and the Rise of Chicago’s 99% (Chicago: Haymarket, 2013); and Paul Street, They Rule: The 1% vs. Democracy (Boulder: Paradigm, 2014).